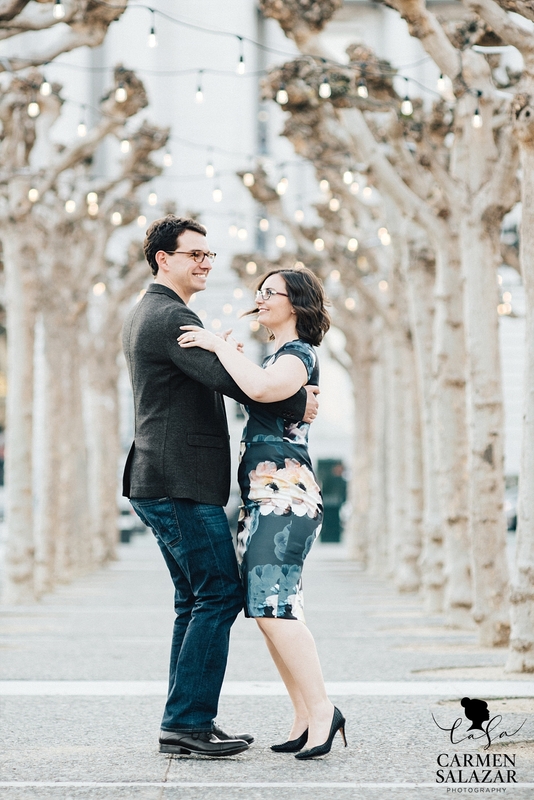 I’m so excited to share Katie and Nolan’s spring engagement in the Castro District! The couple first met in San Francisco after the opening night of Cinderella at the San Francisco Ballet. Nolan noticed Katie out of the crowd and struck up a conversation to get to know her better. Once the two hit it off, they danced the rest of the night away. It was only fitting that they not only came back to the place they met but also where Nolan popped the question! He’s quite the romantic! While the couple took a glance at each other, I couldn’t help but notice their cute matching Chuck Taylors. It perfectly fit the artsy mural behind them with their adorable pup, Bella, in the center. 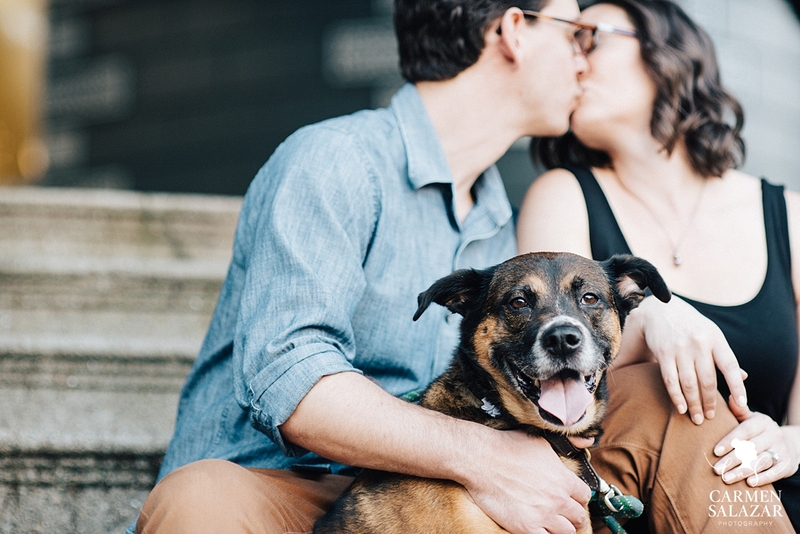 Seriously, can I just photograph only couples that want dogs in their engagement session?!?!?! It that too much to ask? lol! 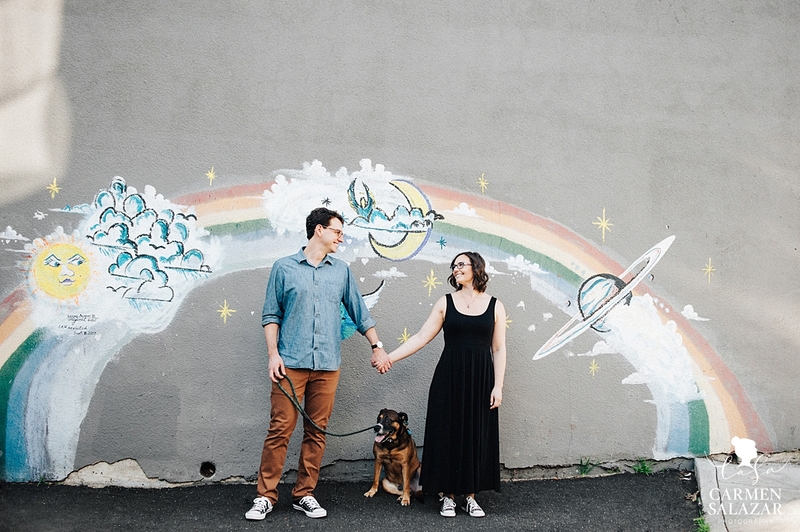 PS…This local mural reminded me of the Sacramento midtown engagement session I did recently. I love these urban artful surprises! Katie and Nolan couldn’t pass up a chance to share a dance under the lights at the capital. 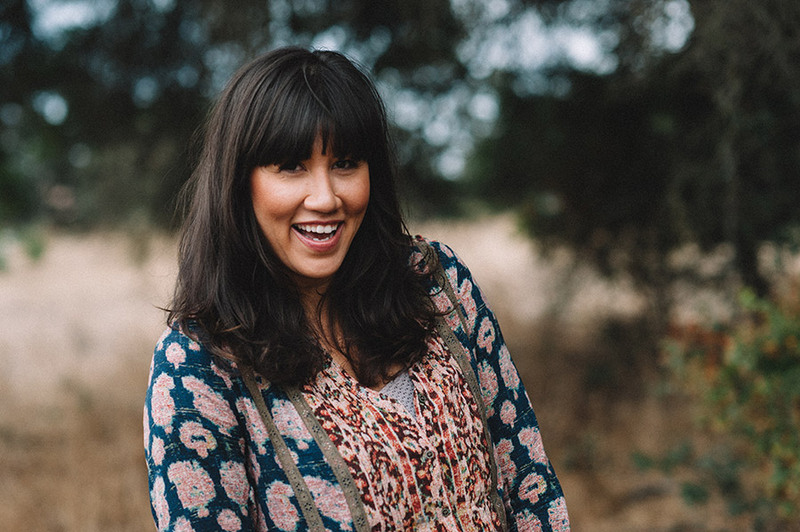 Katie loves Nolan’s goofy personality, and the support she gets from him in life as she pursues her goals. I love couples that support each other’s dreams and aspirations while remembering to be goofy in the midst of it all. This photo may not show it, but these two are pros on the dance floor. I can’t wait to share their Lake Tahoe wedding with you shortly. Some real dance floor magic was made! 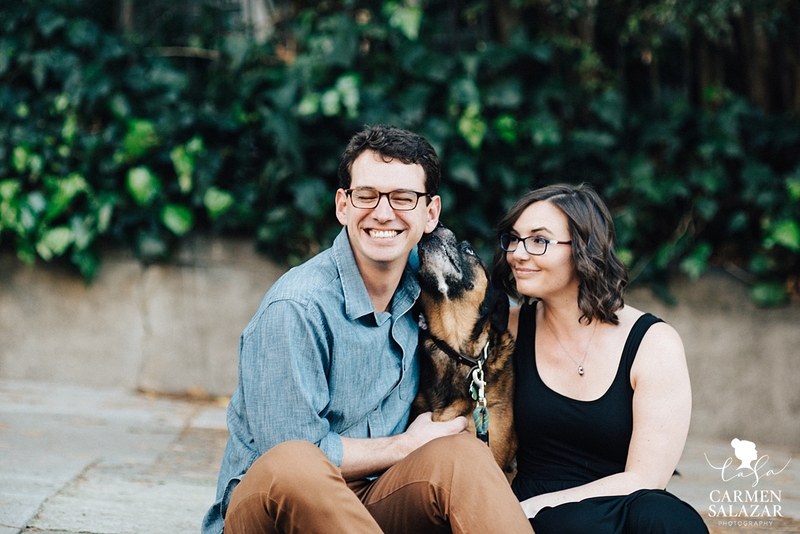 Nolan fell head over heels for Katie’s authentic smile and the way her eyes look when she says, “I love you.” Their favorite thing to do is to laugh together while drinking wine and enjoying each other’s company while running everyday errands. Their dog Bella, is a huge part of their life and such a cute member of their love story. 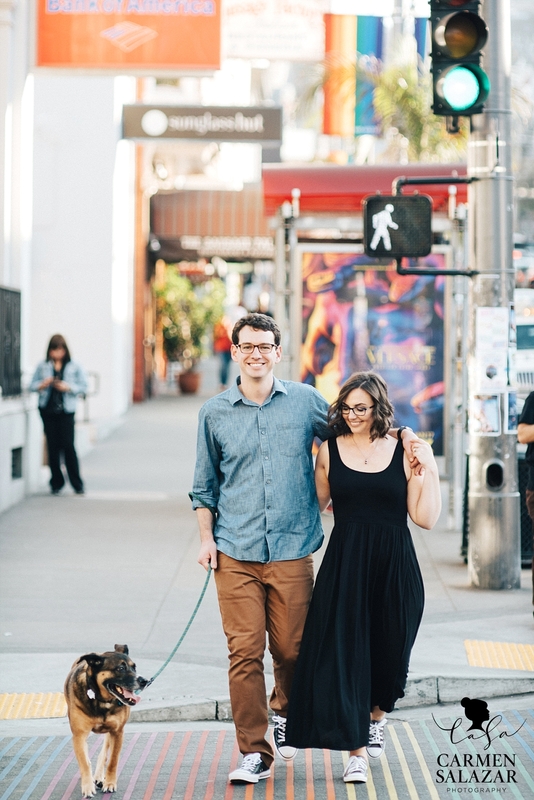 They love walking her and they were dressed for the occasion in these casual engagement photos. Just in case you were wondering, I LOVE everything about this photo. It’s my absolute favorite! Puppy dog kisses are the best! Bella obviously takes after the goofy and loving trait that Katie and Nolan share. As you can see, Bella was a bit distracting for me…lol! 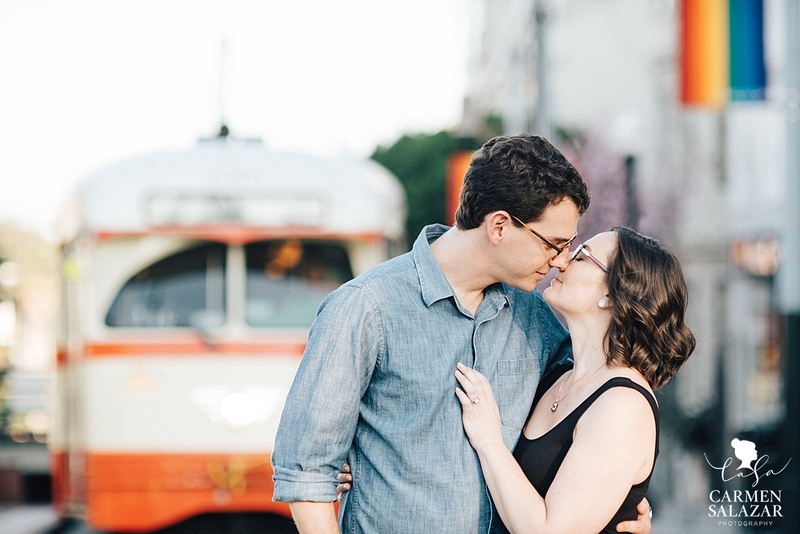 I love the classic San Francisco trolley which arrived at the perfect time behind the couple. 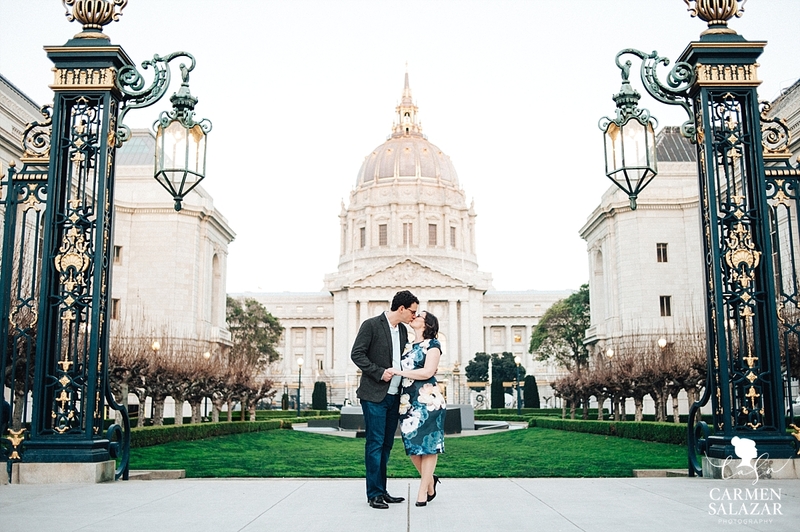 The clear spring sky in the city was the perfect setting for this silhouette photo of the couple. 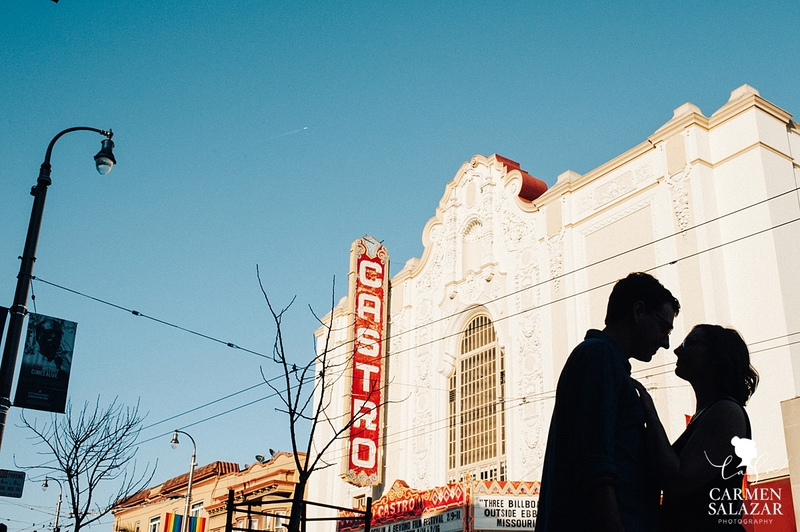 The Castro never disappoints with all its charm! A steamy little moment on the streets of SF between two madly in love amazing human beings! The world needs more of this! 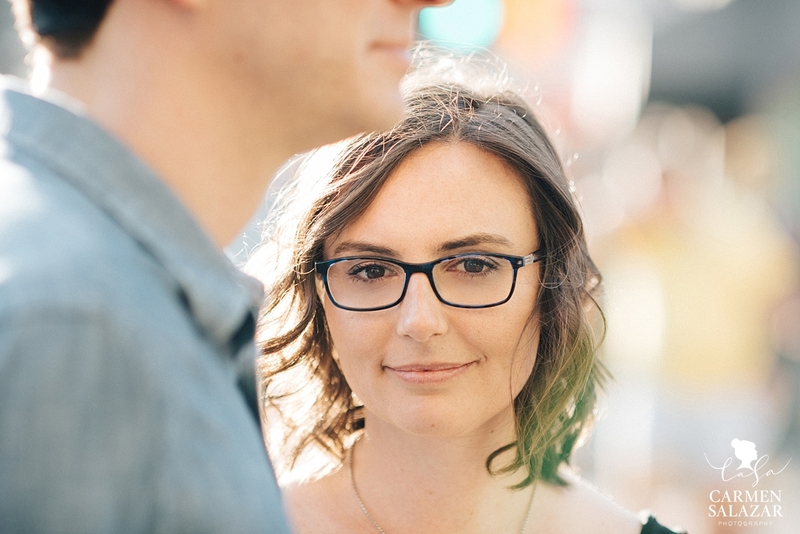 Katie and Nolan…thank you for sharing your world with me! 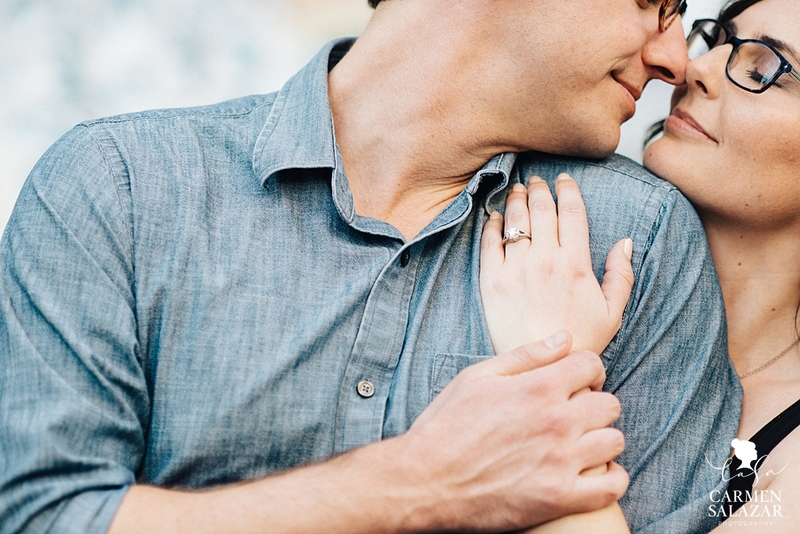 Stay tuned for their wedding post soon…it’s a stunner!